I love this unique view! Almost looks like a split-screen shot at first glance, but it isn't. It's one whole shot! Beautiful. Doesn't look like this anymore, though. The Sunrise Shopping Center was a two-level outdoor shopping complex originally, but was enclosed and redeveloped in 1980, emerging as the new, Galleria Mall, from then on. Here's their current website. Very cool! I don't think I've ever seen a shopping built in a two level form like that. 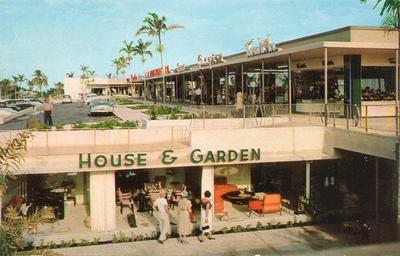 Mall's are built similar to that today with the first floor kinda being underground. I didn't know some shopping centers are/were built like that. I just want taht Orange furniture set for my Apartment... That totally rocks! Absolutely beautiful! One of the best retro mall designs I've ever seen! 1. That logo design is way cool and contemporary...looks modern. 2. If I had a time travel machine [with lots of storage], I'd most likely use it and head straight for this store.